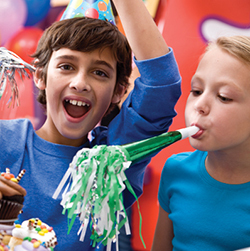 A Case Study on Fun Brands Inc.
PhotoTouch works with BounceU and Pump It Up – party facilities that specialize in children’s parties – to help offer photo packages to friends and family who want to document their celebration without the hassle of taking their own pictures. Instead of focusing on physical prints, the PhotoTouch system at these locations is customized to optimize toward online views and downloads. Both BounceU and Pump It Up use the PhotoTouch photo system to enhance the party experience through on-site photography services. During each party, team members take photos of guests that the PhotoTouch system displays in private party rooms via photo slideshows. Photos are also automatically uploaded to the party facility’s website, providing online access to party guests who want to view and download their images using a personalized login code. PhotoTouch technology has been installed in 49 BounceU locations and 127 Pump It Up locations across the United States. There have been 3.5 million photo uploads to BounceU.com. There have also been 106,000 Facebook posts and more than 135,000 photo downloads. There have been nearly 14 million photo uploads to Pump It Up, including 5.8 million photo view logins at PumpitUpParty.com and 863,805 photo downloads.